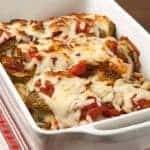 This is one of our favorite ways to prepare eggplant – similar in flavor to eggplant parmesan, but with less work, less fat and fewer calories. 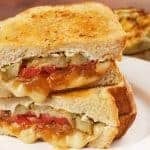 Made with rounds of roasted eggplant,homemade marinara, thinly sliced provolone and a topping of shredded mozzarella, it’s great served with pasta for a meatless meal and the leftovers make fantastic sandwiches. 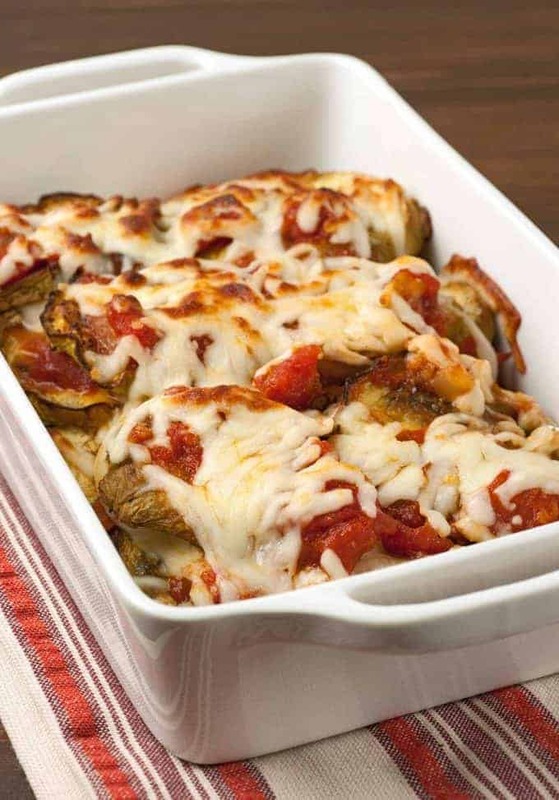 Layers of roasted eggplant, homemade marinara, provolone and mozzarella cheese are baked until bubbly. 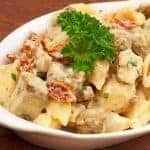 Serve with pasta and a salad for a meatless dinner. Preheat the oven to 400°F and line 2 baking sheets with parchment. 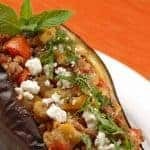 Place both sheets in the oven and roast until the eggplant is tender and lightly caramelized, 12 to 15 minutes. Rotate the position of the sheets at least once to ensure even cooking. 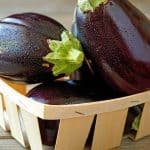 Remove the eggplant from the oven and reduce the heat to 375°F. Coat a small casserole with nonstick spray and add a layer of eggplant, overlapping the slices slightly. Spoon a little of the sauce over the eggplant and top with slices of provolone. Repeat the process with the remaining eggplant, but finish with the shredded mozzarella. Bake uncovered, until the cheese is melted and bubbly, 10 to 12 minutes. Serve with pasta if desired. The quantities of sauce and cheese are somewhat flexible in this recipe. If you like a lot of sauce, feel free to use more. The same theory applies to the cheese. made this tonite. soo easy!!!!!!!!!! came out just like eggplant parm only not as greasy. eggplant was very tender and more flavorful without all the breading. added some oregano and garlic powder. will make absolutely make again and share with friends! So glad you liked this recipe. Thanks for taking the time to let us know!